Our journey to find great church communications takes us to Anchorage, Alaska, where ChangePoint went through a complete communications overhaul. But the church, which averages 3,000 attendees a week, decided to rethink what they were doing. What if they didn’t have to do anything? What if ChangePoint started over with only one thing in mind: Its people? The goal was to communicate with ChangePoiners wherever they might be. To accomplish that aim, they decided to focus on two things: mobile communications and a revamped weekly bulletin. After noticing a large number of web visitors coming via a mobile device, not a surprise given the church’s younger demographic, ChangePoint decided to launch a mobile app on iPad, iPhone and Android using the company The Church App. Within the first three months, the app was downloaded 1,800 times and used more than 9,000 times. 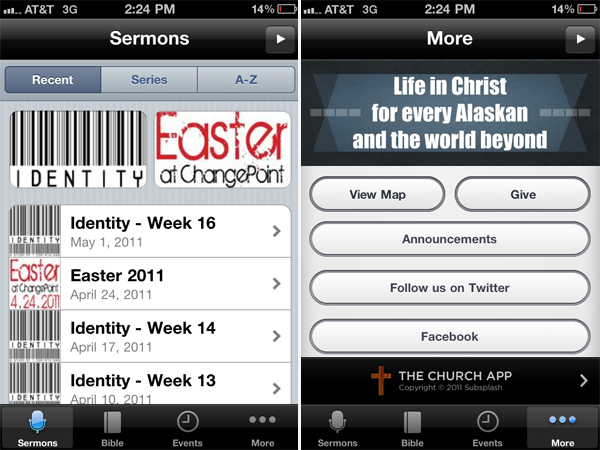 In the first month, the online sermons were listened to 500 more times than before launching the app. The second part of ChangePoint’s revamp strategy was to redo the weekly print bulletins. After getting some feedback from the congregation, the church launched a new bulletin design that’s a third of the size. It’s printed in-house, in black and white, and contains the top events coming up, giving information and details about the current message. The church still provides paper for sermon notes but those handouts are not date specific. People pick them up on the way into the sanctuary and the church saved money by printing those in bulk. In total, the $25,000 bulletin budget shrunk to $6,000. Up next for ChangePoint is a way to better reach their entire family and surrounding community. Anchorage’s diverse population means there are several languages spoken in the city. The church has identified five of the core languages and wants to translate into those languages important pages on their website, like the sections on about us, what to expect and visitor information. Impressive expansion of communication with a decrease in spending! Any chance we could see examples of their weekly bulletin (before and after) to see how they changed it to save so much money? The power of awareness shines through in this article. Kudos to the church for taking to time to understand their congregation, and how to best reach them from a marketing perspective. Moreover, whether one is utilizing a established mobile app, an email marketing agency, or a number of other ways to communicate with your congregation, make sure the medium checks out. This rings true with how ChangePoint dealt with an inefficient bulletin strategy. Not only was the material not being read, it was wasting money that could have been put to better use. The church assessed the situation, and has since optimized their bulletin program for communication as well as saved money!